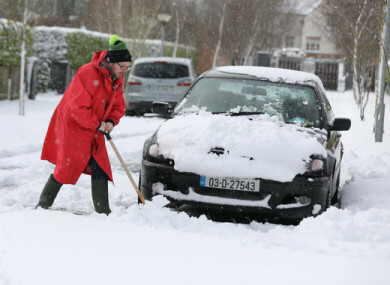 Photographer Leon Farrell digs his car out of the snow in Athgarvan, Co Kildare, yesterday. ROAD CONDITIONS ARE back to normal in many areas this morning, after heavy snow lead to poor driving conditions and the cancellation of a raft of events across the eastern half of the country yesterday. A homecoming for the triumphant Ireland rugby team at the Aviva Stadium and the St Patrick’s Festival ‘Big Day Out’ at Merrion Square were among the events to fall victim to the weather in Dublin yesterday. The organisers of the St Patrick’s Festival confirmed this morning that the Merrion Square event, billed as a “day-long street carnival” won’t be going ahead today. Many of the performers booked for the day weren’t available again today, festival CEO Susan Kirby told RTÉ’s Morning Ireland. “Lots of other programmes are going ahead – anything that is indoors is going ahead,” she said. The best thing to do is check out the website to keep up to date with the latest information. The rugby homecoming is not expected to be rescheduled either. On the transport front, some routes on higher ground in Co Wicklow are still impassable this morning due to snow. Road conditions elsewhere in the counties worst hit by the wintry weather are more-or-less back to normal. A status yellow snow-ice warning that was in effect this morning has now been lifted. Gardaí in Monaghan Town and Naas are reporting frosty conditions on secondary routes, according to AA Roadwatch’s latest update this morning. In Wicklow, according to the AA, the Kilmacanogue/Roundwood Rd (R755) is still impassable – as is the Sally Gap. Dublin traffic is moving as normal. Weatherwise, the forecast for today is for largely dry conditions with isolated showers in the east and south, Met Éireann says. There’ll be some sunshine this afternoon. Temperatures will reach 3 to 6 degrees. Temperatures will recover a little tomorrow, to 7 or 8 degrees, but only after a freezing cold night with the mercury dipping as low as minus 3 or 4. By Wednesday, temperatures will be back in the low double digits – up to 11 degrees in the afternoon. Email “St Patrick's 'Big Day Out' won't be rescheduled for today”. Feedback on “St Patrick's 'Big Day Out' won't be rescheduled for today”.